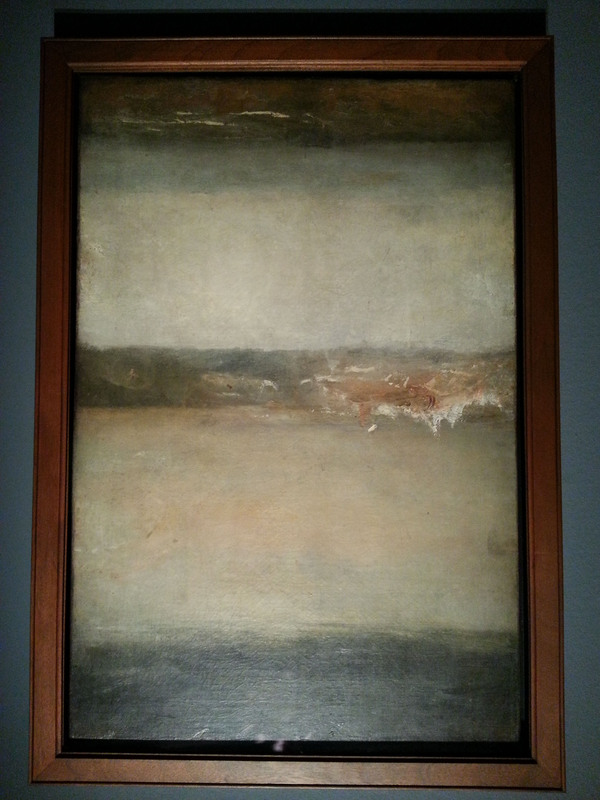 While in Adelaide I saw the Turner from the Tate exhibition at the Art Gallery of South Australia, closing 19 May. This exhibition will open in Canberra at the National Gallery of Australia on 1 June. The visitors numbers were reasonable so we were able to have a really good look at the works. Much to my surprise you were allowed to take photos in the exhibition as long as you didn’t use a flash (don’t expect such liberties in Canberra). 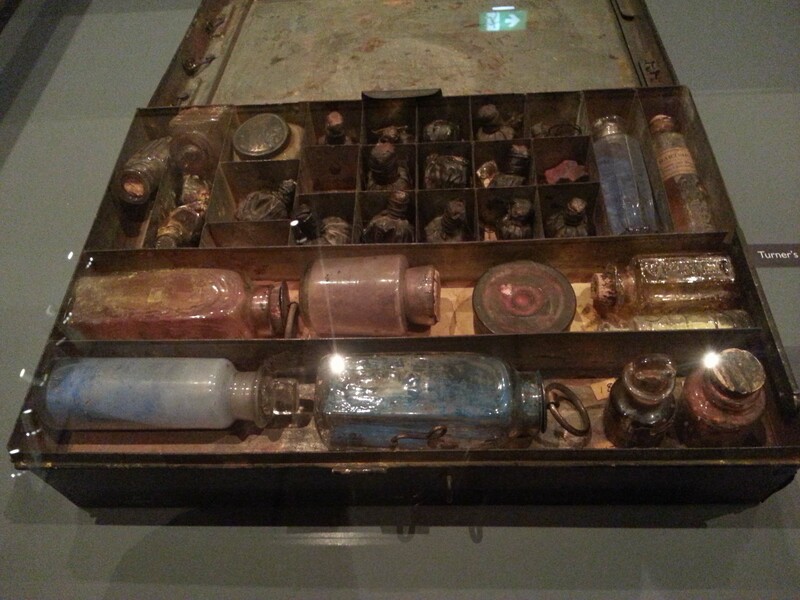 Here is Turner’s paint box. The rounded shapes at the top are the pigs bladders in which the mixed pigments were carried. What I really enjoyed about this exhibition was the number of studies and sketches that were included. 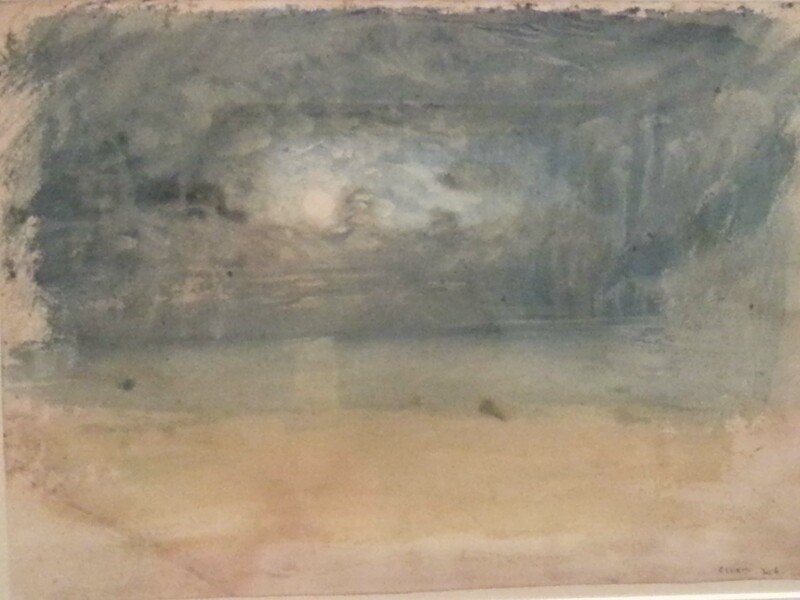 I am intrigued by the Turner’s process, particularly his watercolours. 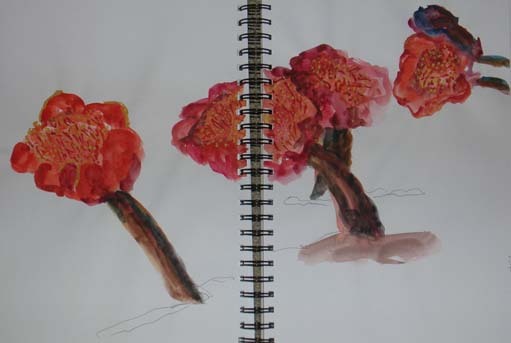 Some of were titlted “A Beginning” and were colour studies or pieces left almost as soon as they were started. If you want to see more of this type of work the Tate Gallery (holders of the Turner Bequest) have digitised Turner’s sketchbooks. If you look at the Turner’s Finberg sketchbook you will see many colour studies which to our contemporary eyes look like abstract works. In these works there is only an occasional figure or recognisable shape emerging from the picture. No wonder Turner’s contemporaries had trouble understanding these works. Whenever I go to an exhibition I like to play the game of “if I could take one piece from this exhibition …” . For this exhibition my number one pick would be this triple seascape study, Three Seascapes, c 1827. 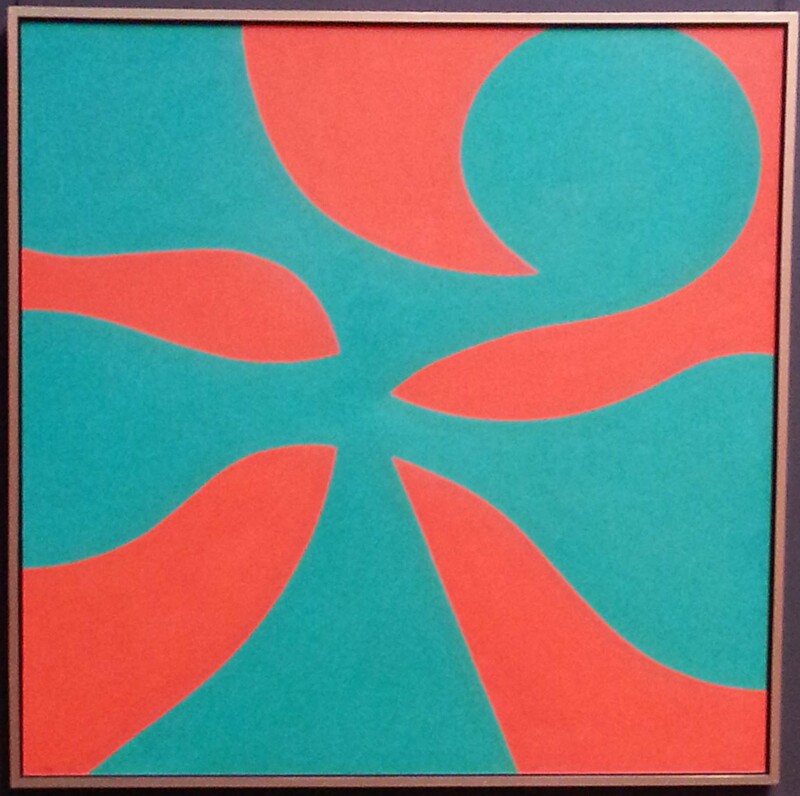 What is interesting is that the painting also works when it is turned upside down. The dark section at the top becomes the land and the centre section’s sea and sky for become reversed for the lower section of the work. I wonder did Mark Rothko ever see this work? The works in the exhibition are drawn from the Turner Bequest to the Tate Gallery. If you want to see more the Tate has digitised the bequest so you can look at your leisure, that is as long as you have plenty of time to look (when I checked it showed over 2,000 pages of work)! When I opened my drawing pad last week I found several watercolour sketches that I had done in February. 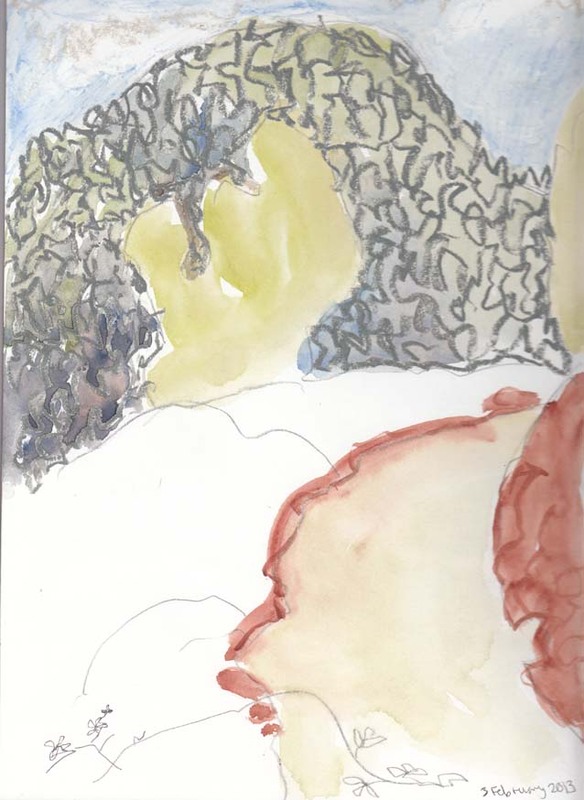 At that time I was still in the early stages of recovery from knee surgery, so while my partner and friends were picking blackberries I got to sit and paint. I was trying to put into effect some of the techniques David Hockney uses, particularly using pencil and other fine markers over watercolour and trying to use both pages of the book. 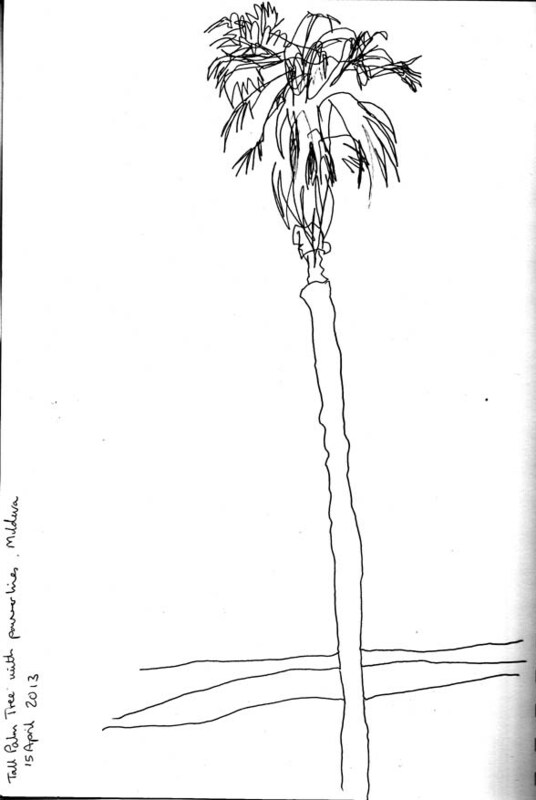 (I’d been given a copy of David Hockney’s A Yorkshire Sketchbook, for Christmas). 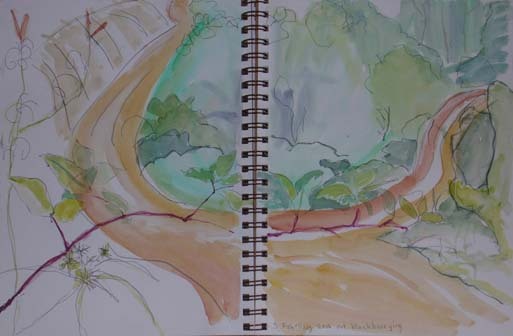 My opening sketch was the road and bushes where we pick blackberries. I then turned around and drew the road behind me. This sketch was unfinished. 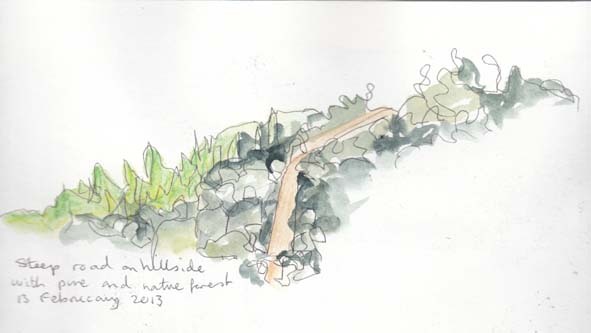 The next time we went picking (we go out frequently during blackberry season) our location looked up to a steep hillside where a rather vertiginous road could be seen. 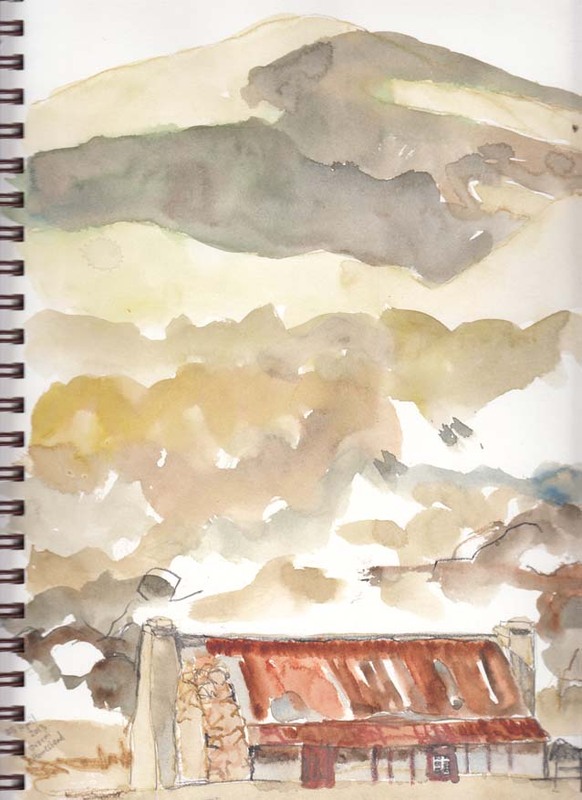 Taking advantage of the ANZAC Day public holiday we decided to pack a picnic lunch and head down to the Namadgi National Park in the southern ACT (Australian Capital Territory) for a spot of drawing. 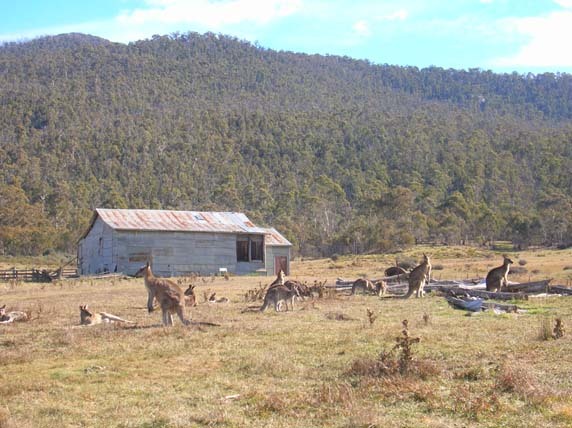 Our destination was the Orroral Valley and in particular the old Orroral homestead which was built in the late 1860’s. Apart from the homestead itself there is a great corrugated iron shearing shed which was built in the 1930’s and a second house from the 1950’s (which has largely been demolished). I spent a lot of time looking around and taking photos so in the end I managed only two water colours. 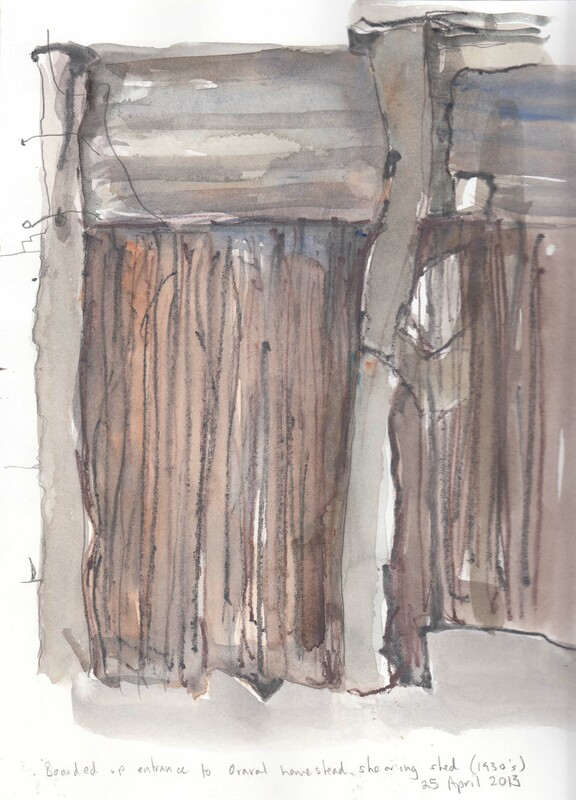 This is one of the old set of doors into the shearing shed – all the doors and windows have been blocked off, presumably to deter vandalism. The second is the old homestead, looking at the rear of the building. The house, which consists of four rooms faces the valley wall and Orroral rocks. 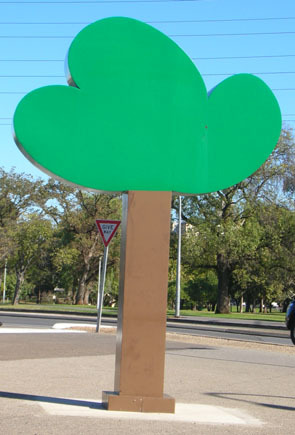 When I was in Adelaide a few weeks ago my eye was caught by this sculpture Tree, 2012, by Craige Andrae, which is located on Dequetteville Terrace. Later in the day I was walking through the Art Gallery of South Australia when I spotted this painting by John Coburn (1925-2006). Quite serendipitous I thought. Sadly I cannot tell you what the painting’s title is or when it was painted, as the fire alarm went off as we were passing and we had to evacuate the building! 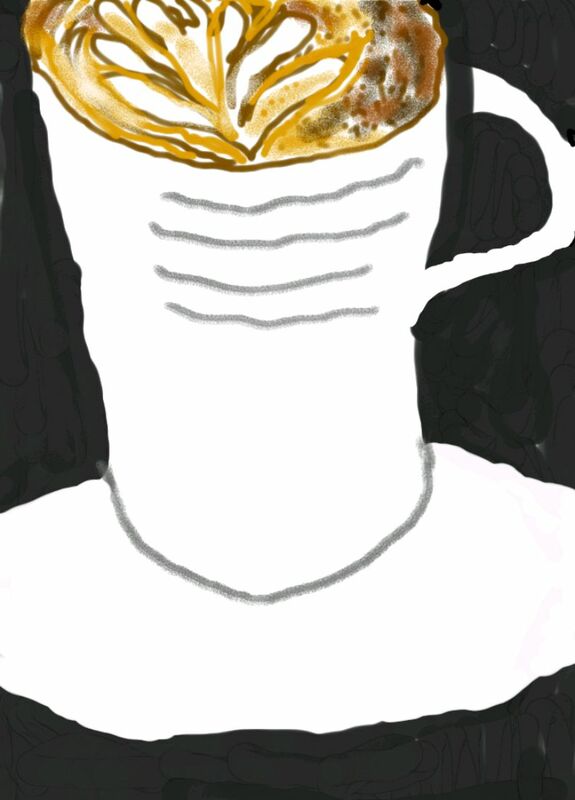 As can be seen by the following evidence I still haven’t mastered placing my drawings on my tablet! I’d like to say that the cut off top was a design decision, but no. Oh well! On our way back from Adelaide we stopped in Mildura overnight. We had a great view from our balconyof the date palms lining the road outside the hotel. 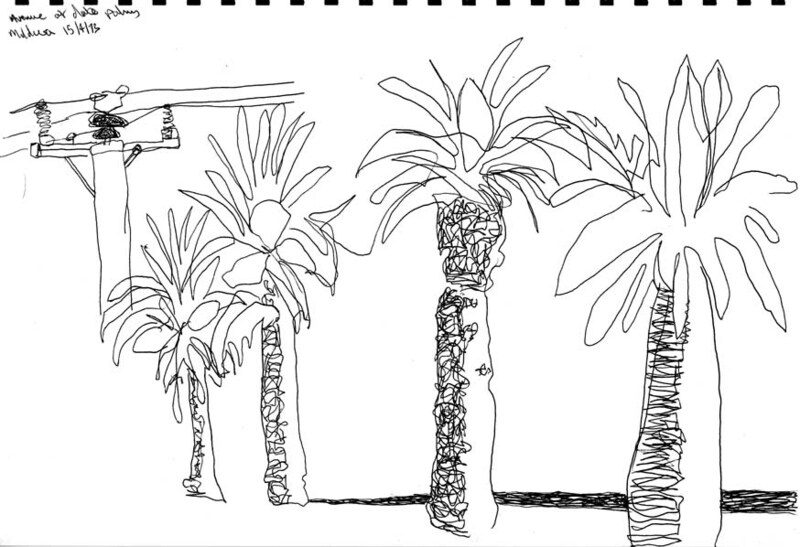 The power pole in the corner is what I started drawing – then I decided to do the date palms instead. The Wittunga Botanic Gardens in the Adelaide Hills suburb of Blackwood is a popular place for walks and picnics. It also has some beautiful garden displays of South African plants. At this time of year the South African bulbs are at their best. One of the most striking is Haemanthus coccineus, the Blood Flower or Paintbrush Lily. It s flower springs from the soil on a short robust stem. I was lucky to find several flowers open in one spot. 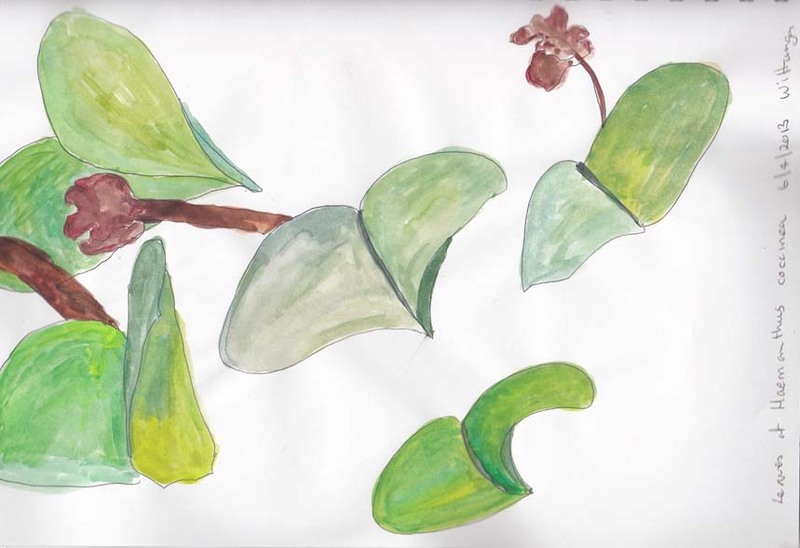 Once the flower is spent the broad fleshy leaves emerge, and the flowers wither to brown.